20 Moses and Aaron did just as the Lord had commanded. 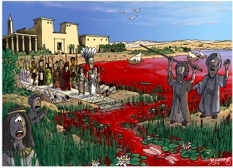 He raised his staff in the presence of Pharaoh and his officials and struck the water of the Nile, and all the water was changed into blood. 21 The fish in the Nile died, and the river smelled so bad that the Egyptians could not drink its water. 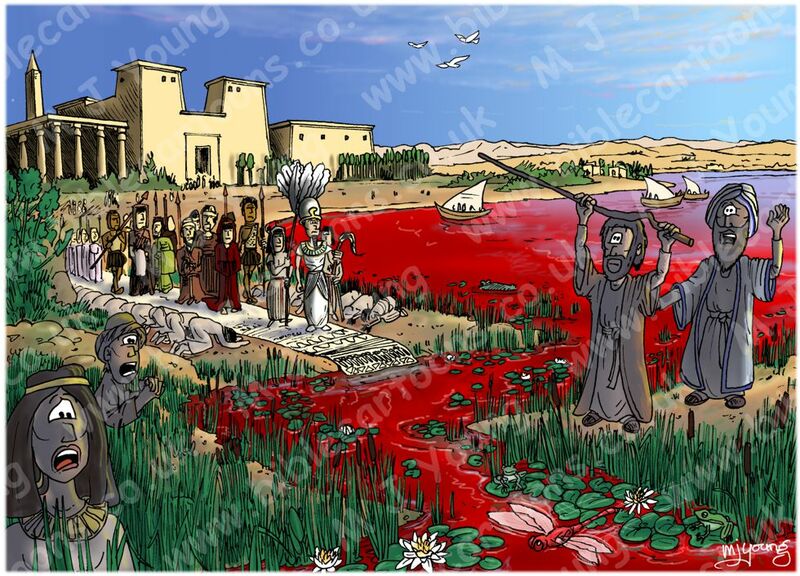 Blood was everywhere in Egypt. 22 But the Egyptian magicians did the same things by their secret arts, and Pharaoh’s heart became hard; he would not listen to Moses and Aaron, just as the Lord had said. 23 Instead, he turned and went into his palace, and did not take even this to heart. 24 And all the Egyptians dug along the Nile to get drinking water, because they could not drink the water of the river. We know the scene is morning because verse 15 reads, ‘Go to Pharaoh in the morning as he goes out to the water,’ I have set the scene early, just as the sun is rising. The early morning sunlight, just peeping over the horizon is lighting the scene. Strong shadows cover Moses & Aaron (on the right of the cartoon) as they have their backs to the rising sun. Moses & Aaron, in the foreground, on the right of the cartoon. An Egyptian woman & man, in the foreground, on the left of the cartoon. You can just make out Pharoah & his officials, walking towards Moses, across the river. Pharoah is dressed in white, with a large dome-like headdress on, flanked by two women slaves who are waving ostrich feathers on poles behind him. Various officials (& magicians) are behind Pharoah. Notice the Nile Crocodile gradually swimming closer to the shore. There is a dragonfly as well. Also note the 2 green frogs sitting on lily pads… portents of the next plague! The exact setting is not specified in the text. I have set the scene on an imaginary Nile river bank. Yo can see Pharoah’s splendid palace in the background, which is based on photographs of the Great Hall of the Temple of Horus in the city Thebes, Egypt. The green frogs are Mascarene Grass Frog, also called Mascarene Grassland Frog, Mascarene Ridged Frog.) the scientific name is Rana mascariensis. There are several examples of the Tiger Lotus (also called White lotus or Egyptian White Water-lily (Nymphaea lotus)) in the foreground.